As a seven-year-old boy in the Rosebery internment camp, Henry Wakabayashi used to play by the shores of Slocan Lake, which lay just outside the small home that he shared with his family. At seven, Wakabayashi had little concept of the stresses put on his family and thousands of other Japanese Canadians by the expulsion from the coast brought on by the Japanese attack on Pearl Harbor. Instead, he remembers an idyllic childhood exploring the woods, filled with deer and moose, and making driftwood rafts on the shore of the lake. Although fishing was officially forbidden, he and his friends would mix flour with water, put it on bent pin hooks, and catch small fish. On November 5, 2009, 67 years after arriving in Roseberry as an enemy alien, Henry Wakabayashi stood before Her Excellency the Right Honourable Michaëlle Jean, Governor General of Canada to be named a Member of the Order of Canada. The honour was given based on 50 years devoted to infrastructure improvements throughout British Columbia and beyond. As founder of Pacific Liaicon Ltd., he has helmed many major projects such as the Vancouver Sky Train, the expansion of the Vancouver International Airport and the Metro Vancouver drinking water treatment program. More recently, he has been involved with the expansion of the Vancouver Convention and Exhibition Centre, and has provided senior advisory services to the Vancouver Organizing Committee for the 2010 Olympic and Paralympic Games. He is also active within British Columbia’s Nikkei community through his involvement in the Momiji Garden project and the National Nikkei Heritage Centre. Wakabayashi previously received the Order of British Columbia in 2000. Henry Wakabayashi spoke to The Bulletin a few days after returning from Ottawa to receive his award. So you’ve already been to Ottawa and received your award, how was that? Well it was really interesting. I don’t think we appreciate, you know, the type of people we have in Canada, because the ones that won the award, they come from all walks of life. Peter Mansbridge was there. Raymond Moriyama moved up a notch. In fact I think he reached the highest level now. Mike Weir, he was there. He’s a W, so he followed behind me. Being a golf fan, I got to talk to him. So it’s kind of interesting. And they’re from all across Canada, obviously. And so, to be able to hobnob with that type of people is pretty good. And you realize that regardless of how high they’ve gotten in their career they’re still people at the end of the day. My wife and I were going to take our two daughters and my granddaughter, but the one daughter couldn’t come because the baby was sick, but the granddaughter came. She was six, and she just had a great time. And then at the reception, we were able to walk around and introduce her to everybody, and everybody was interested in this little girl. So she got her picture taken with everybody and it worked without quite well. I told her, I’m taking her because I want her to remember this occasion, and hopefully 50 years from now she’ll be up there. I believe there are different levels of the Order of Canada . . . Exactly, yeah. I’m at the first level, it’s called the member. I think there’s three levels in all. You go in at the bottom and then you work your way up. And as I say, I think Raymond Moriyama has worked his way up to the top. Have you two ever worked together professionally? Well, Raymond, as you know, did the concept on the National Nikkei Heritage Centre. The whole concept of that building came from him, although Ken Takeuchi picked it up and ran with it, but Raymond did that, and he also did the Canadian Embassy in Tokyo. I don’t know if you’ve seen that. There’s one room where there’s stars up there, or lights resembling the stars, and it supposedly came from his idea of what he thought it looked like when he had a tree house in Slocan or something. I mean, I don’t know how you remember where each star was, but it was kind of interesting. He must be in his 80s now, and I think he’s turned the company basically over to his son, but I think he just recently did something in Saudi Arabia, the Canadian Embassy in Saudi Arabia, or something like that. I was just in Tokyo. I should have gone to the embassy. You know, it’s amazing—as you get to be adults—to go over there and you just feel it’s your home in a way. I know one friend of mine, he went when he was 60. He’d never been before, and he didn’t really want to go to Japan, but once he was there, he just felt that it was home, and he wanted to go back again, he enjoyed it so much. In the bios I read on you, they all talk about your business achievements, but I thought we could start with your family and your history in Canada. But there are things about the place that I remember. We had double bunk beds and they gave us those blankets to put around it, and that was kind of our home. But here we were, we were all kids, eh. And I guess my recollection of the war is, when it broke out, we had a dry cleaning laundry on Commercial Drive, and I remember the police coming one day and I think my dad had a car, and I don’t know why but I think he also had a gun, and they took it away, and then came back a few days later and said they lost it or whatever. But the next thing my dad is moved off to a road camp. I think it was Thunder River along the north Thompson there. And so we had to obviously get out of the business, and we moved into Marpole with our relatives, and then we moved to Hastings Park, and it wasn’t until we moved on to Rosebery that we saw our dad again. He had gone from Thunder River to Rosebery, and they were there building the homes so that we could relocate there. I’ve gone back to Rosebery since, to where we used to live, and I knew we’d lived by the lake. Well, when you’re kids, it seems like it’s about a hundred yards away from the lake but in actual fact it’s probably more like about 20, 25. When we went back in 1974, the gazebo my dad had built on the lake shore was still there. The houses were all gone. And, you know, we had a lot of fun as kids. There used to be a Boy Scout troupe, and we used to run around there, we used to chase deer, porcupine, whatever. But there’s no question it was very difficult on our moms and dads. Mom was probably in her late 30s, my dad early 40s and you know that’s about the same age my daughters are today. So they weren’t old and obviously their lives were very difficult and disrupted. I was asked one day to speak at a Jewish school because they were reading Obasan, and they knew I had a different perspective on it. And the way I tried to explain it to them was, you know, our parents came here and they were prepared to sacrifice their generation for the kids. I mean, Japanese parents always think about their kids more than themselves. And I would think that if the war hadn’t broken out, we probably would have been sent back to Japan to get an education and eventually to carry on in Japan. And because the war broke out, and Japan lost the war and we decided to live here, I think it totally changed our lives, and probably the lives of a lot of people in our generation. Most of the Japanese never really set roots here. We used to live around Kitsilano, or we lived on Commercial Drive, but there was never the idea, as we have today, where we wanted to own our own house and get settled down. It was kind of a temporary stay here. My dad spoke English, and I think he did quite well in business. So we went to Rosebery and probably stayed there a couple of years, and then a decision had to be made: to go back to Japan or move on. If you’re going to go to Japan, then you got relocated to Tashme. The idea was that when the ship came in, it was a short haul to take you from Tashme to Vancouver. Except my sister, who was probably about 13 at the time, somehow decided that we really didn’t want to go back to Japan. We had already committed, so they moved us to Tashme. Now we had to kind of un-commit ourselves. Before the war, my mother used to do housekeeping for a lawyer, Mr. Symes. He found out where we were, and every Christmas we would get a Christmas package from them—not toys or anything, just food. So when my sister decided that she didn’t want to go, my dad got in touch with Mr. Symes. He knew how to get a hold of him, because we had these packages, and he organized for us to retract our position. And so we now decided to stay in Canada, the war was over, and then we moved to Kamloops. We were probably getting on ‘46 now, so I guess I’m 12 by then. But we got no money. Coming out of the relocation centres, nobody’s got any money. The men used to get paid two bits an hour for working around the complex. And then they took one cent an hour off for rent. Now, there’s no question, as I say, that it was really tough on my parents. I still remember when I was in school, it was Queen Alexander at Broadway and Clark. When my wife started teaching school in Vancouver, she went to a conference and she met a lady and her name was Ms. Campbell, and she said, “Oh, I used to have a boy by that name in my school.” She was just retiring then. So I went and saw her, and she was really pleased, and she said, “You know, I still remember you, you used to sit right over there.” And whether I did or didn’t, I was quite impressed, but she said, “The reason why I remember you is that here was this little boy, who had nothing to do with what was going on in the Pacific, and your father came and said because of the war he was taking you out of school.” So I mean, there were non-supporters and supporters in those days and that teacher was obviously one of them. And so we sat and talked a bit more about what had happened. I’ve since gone back to that school, because they had their hundredth anniversary, you know, and met the principal, and when I won the Order of British Columbia, she put it in the newsletter. In Kamloops, I can still remember when I was in high school, we were all asked, you know, what nationality we were, and I remember saying Japanese Canadian, and my teacher says, you’re not Japanese Canadian. You were born here. You’re a Canadian. So there was a lot of support along the way to make us what we are today. I mean, so to me, you know, we’ve gone in a circle. So anyway, in Kamloops, we lived in picker shacks, and you know when I was up there waiting to get my award in Ottawa, I thought back to those days, I mean, here we are, we’re living in a picker shack, no plumbing, and the whole family works all day in the hops yard in the hot sun, and makes two bucks a day. I mean, we started from that, and so you appreciate things as you go. So what happened after high school? I spent an extra year in high school because I wanted to play basketball. When I got out of school I went to work in the sawmill because I hadn’t any real plans about what I wanted to do, and all the Japanese men used to work there. The women used to work on the farm. But I decided, well, this is not for me, I guess maybe I should find some other career. And so I went to work for him, 300 bucks a month, which was about what my engineer friends were making. And he was a really good teacher. I mean, I stayed there for almost ten years, and I tell people that it was probably better than getting an MBA from Harvard, you know. This is at a time when the Japanese weren’t allowed in golf courses or any of those clubs downtown. Trader Vic’s had just opened up in the Bayshore Inn there, and we would take our clients there, and he said, “Henry, it’s really important that you tip well, and they recognize you, because you know in Japan they’re just trying to get into the business here, and we just didn’t get the opportunities.” Over the years I remember, I used to go to dinner with Mr. Minagawa and our clients, and the maître’d would always say, “Oh, Mr. Minagawa” and take us to the table, setting the impression that we were businessmen, you know, good businessmen, very high level. When we used to go on business trips we were only allowed so much allowance, but Mr. Minagawa always told me that no matter what you do, you stay in a good hotel because your clients are going to ask you what hotel are you staying at it. He taught me to make sure I had my shoes shined, I had the right tie on, my hair cut. I mean, he just totally trained me. We used to go to Hi’s Encore, the steak house. People weren’t used to being taken out for dinner, so when they looked at the menu they didn’t know what to order. They didn’t want to buy the most expensive, they didn’t want to buy the cheapest, so they would buy something in between, and so Mr. Minagawa we would sit down, and we’re all having our drinks, and it’s time to order, and he would always say, “Henry, I guess you’re going to have the 16 ounce sirloin, okay?” If you look at the menu, that was the most expensive thing, and nine times out of ten I wouldn’t necessarily have that, but it gave everybody an idea that, you know, it was wide open, order what you want. And it’s all these little things that even to this day, you know I kind of try and tell my people that this is how you do it about making people feel comfortable. You know that training was unbelievable. When Mr. Minagawa used to tell me these things I used to think, you know, why is he pushing me like that? But you go home that night and realize he wasn’t doing it for himself, he was doing it for me. And I always think that a lot of engineers come through university and they don’t end up like we have, and it’s because I learned a little bit of business along the way. This was at a time when Japanese products didn’t have a good reputation for quality and must have been around the time that Japan began a push to turn things around . . .
Well for example, this is Mitsubishi, one of the biggest companies in the world, and I’m selling things like cigarette lighters. I get an order for $400 of cigarette lighters, you know, with logos on them. I sold 20,000 black umbrellas to Kelly Douglas—they used to give them away as a premium. Everybody’s wearing tan rain coats in those days, okay? So they use it, and it hasn’t been colour fasted, you know, and all the black runs down, so I got 20,000 umbrellas back. Mr. Minagawa and I used to sell toys to the biggest companies, so we’d get a sample of toys, and he’d get me to buy some batteries and we’d set them up, and we’re playing with them on the floor. And so we would get a thousand dollar order from one store, maybe a five hundred dollar order from somebody else. These are tin can toys that if you open them up on the backside would be labels of re-used tin cans. And so we sell a thousand dollars worth of toys, and in January, we probably get five hundred dollar worth of claims because they just didn’t work. And it was those times, okay? But in those nine years, we started turning things around. There was a company called Nihon Gaeshi Kaisha (NGK), and they were selling insulators around the world, and if you go through British Columbia today, you’ll see them. So they were accepted as quality, okay? And that allowed us to go into places like BC Hydro and try to sell other Japanese equipment. In 1964, after months and months, we put in a bid for the five turbines for the Peace River project, Bennett Dam, Gordon Shrum Station. There are seven worldwide bidders on this big order, for five turbines, and we’re at the opening, and we get the bids. They opened ours first, okay, so everybody else knew that we were lower than them. But they didn’t know what to do with us. They were worried about purchasing a less-than-quality product. One day I ran into Dr. Gordon Shrum. He used to be our physics prof, and he also used to be the camp superintendent, or the person who looked after our dormitories, and whenever we used to have water fights and whatever, he used to come, and so he kind of remembered me. And he says, “How’s it going?” and I said, well, not very well. He says, “What do you mean?” I said, well, nobody wants to talk to us. He said, “Who do you want to talk to?” And I said, well, maybe we could talk to the chief engineer. So five minutes later I get a call, “So what do you want to talk about?” I said, well, we’re a little bitter. Nobody wants to talk to us, and we just want to kind of get on with it. So anyway, eventually I brought in a Japanese turbine expert, because I don’t know anything about turbines. This is ‘64. I’ve been with a Japanese company since ‘58. The Japanese we learned at home was very poor. My mom spoke Japanese, broken Japanese, and my father spoke English, okay. And this is Japanese that they knew back in 1930s, from Osaka. When I went to work for Mitsubishi, they all used to laugh, these Tokyo educated guys. There was one word that I learned from my parents, “basement” was downburo. And they didn’t understand what downburo meant. Well, it meant “down below.” So I’ve got this Japanese English all haywire, Osaka-ben. But anyway, now I got a four or five years experience in Japanese, so I could do a little translation. At one point I figured we’d lost it, but we did actually end up getting the order. So that’s a long story to tell you that I think that was a start of Japanese products being considered as quality. We sold those, we sold some intake gates, we sold some valves, so we were really in now, in terms of industrial equipment, probably the biggest in North America at that time, I think. So you went from selling cigarette lighters to turbines? Oh yeah, oh yeah. And then the next thing is, a counsellor in Winnipeg went to the Japanese consul and said GM is screwing us. Every year we go out for tender for buses, it goes up another thousand dollars. Can you Japanese build a bus to compete against these guys? So Mitsubishi said, yeah, they’ll go after it. They buy a bus from Chicago, a GM bus, they take it to Japan, they strip it down and then they build the Canada bus and we bring the trial bus in here. So we got this trial bus in Winnipeg now, okay? It’s 40 below in Winnipeg, and I’m on there one day with the Japanese engineer, they’re using it as a trial bus to see whether they would buy it. We come to a stop sign, the guy opens the door and this lady says, “Is this one of them Jap buses?” I was there, okay, and the guy says, “Yes ma’am.” She says, “Well, I’ll catch the next one.” So that gives a flavour of where we were. But we did sell 15 buses and I look back to that and that’s where we started from. Today people buy Japanese cars because they’re quality. In fact, I guess Japanese cars have helped American cars, you know, bring their quality up. But it was a challenge. People would say things like, you sell Mitsubishi, transistor radios—why don’t the Japanese make quality products like Sony? Sony was smart. They didn’t use their Japanese brand name. They got that name Sony, so everybody figured this wasn’t Japanese for sure, must have been American, or European or whatever, so that was a great marketing ploy on the part of Sony. And I remember Mr. Minagawa saying maybe we should not sell things as Mitsubishi, maybe we should sell it as Three Diamonds, because that’s what Mitsubishi means, right? And you remember Nissan came out with Datsun, before they turned around to use Nissan. And then once it caught on that Japan makes quality and people were beginning to buy Japanese products then, you know they start using the Japanese name. But the reason why it was poor quality, we used to sell ceramics and chinaware to Hudson Bay, and what they would do is they’d come up with a plate and say, can you make this for, say 50 cents or whatever, and you say no, the price is 75. Well they want to get it for 50 cents, okay, so then obviously the quality reflected the price. I guess being Japanese Canadian worked in your favour during those negotiations. Although we’d never lived in Japan, you know, working for Mitsubishi and whatever, you kind of understood the nuances. I know that a lot of people can understand English and speak a lot better English or Japanese than we can, but somehow in our mind there’s still that little bit of Japanese left in us. And in fact people, a lot of the Japanese business people that I work with said we niseis are probably more Japanese than the Japanese of our age, because we’re still back in the 1930s, of what we thought Japanese should be or how they should think. You eventually left Mitsubishi to go into business for yourself. 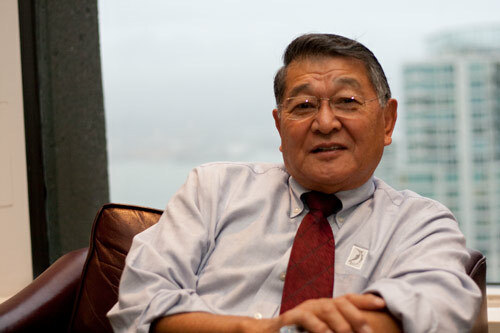 I started my own company in 1970, because in the Mitsubishi Company, age and tenure and being nisei were all against me. Arthur Hara was there, and he was older than me. There was a Caucasian fellow, he had been there longer, and he was older than me. So what happens is, you know, you’re at this level, and you just can’t pass it. I went on assignment to build a pulp mill after about my seventh year. They paid me quite well to move to Cranbrook. And then I came back in my ninth year, and I met the president, and we’re talking about me coming back to Mitsubishi. And I said, you know, I’m stuck back here as number three in this company, of the local employees, and I’d be prepared to take a pay cut, but you need to give me a title, and you need to let me get ahead of these other two guys because this is a one way street, and I’ll always be behind them. And you know we’d sold turbines, we’d sold buses, we had conceived and built the pulp mill. And we also did a mine, so I was really doing well. I mean Mr. Minagawa and I really did a lot of things. And the president turned around and looked the other way, and he said, “I can’t do it, because if we do it here, we’ll have to do it in Chicago and New York and all these other offices and that’s the way it is.” Mr. Minagawa had told me when he hired me that it’s like going in a Japanese bath, you know, it’s like going to the ofuro—it’s never too warm or too cold. So as long as you don’t do any, you know, criminal activity, you can work for Mitsubishi for the rest of your life. So when I realized I couldn’t do this, I decided it was time to move on. We started our own company and I wrote Mr. Minagawa to tell him because he was back in Japan now. I really appreciated everything he had done for me, and what Mitsubishi had done, and he wrote back and said, you know, it’s really brave of you to do that, but it should be a benefit to Mitsubishi, because now they know they have a contact outside of the company. He and I corresponded, we met over the years, whenever he came back, we used to go around, and he went all the way up to Vice President at Mitsubishi Shoji. And then he became president of their aero-space program. He died at about 80, and I wasn’t able to go to the funeral but I still keep in touch with his daughter because the mother, Mrs. Minagawa, has now died. And the girls wrote back and said, you know, our dad has passed away and we’re sorry you couldn’t make it to the funeral but just to let you know, in the latter years, after he retired, he lived his life through me. Like I would tell him all the things I was doing, and as far as he was concerned, he was kind of doing it, you know. So he really saw you as his protégé, I guess? Yeah. And you know I mean I’ll never . . . I’ll never forget some of the things he taught me. That must have been a big step for you, striking out on your own. Well, first of all, I’m only 36, okay. Nihon Gaishi, who I sold for under Mitsubishi, wanted to hire me so I went to them for a year, and then Daishowa was going to build the Caribou pulp mill and they knew that we had built the one in Cranbrook, and so they wanted us to come on. And so I had a three year job. My partner Tom Kobayashi and I set up a company, Pacific Liaicon. The Japanese wanted us, because they wanted to make sure they had somebody on their side that knew about Canada, spoke the language, you know, could translate, and that’s the reason why we called it Liaicon: liaison and consulting. My partner was Kobayashi, and I was Wakabayashi, so Tom’s father gave us a logo which was two trees, the hayashi, that was our logo for years. And so once we got going, I guess over the years, we’ve probably managed about 12 billion dollars worth of work. It sounds like you were able to take advantage of some good opportunities over the years. Yeah, I lucked in. And that’s what I was telling somebody, we were talking in Ottawa, and he was telling me it was a matter of luck for him, he just happened to do this and that, and this is a fellow that got involved in the first liver transplant in Canada, and he just happened to be there at the time, and it carried on. And I think most people are the same. It’s getting that kind of break, you know. Lot of luck, and lot of hard work, I think. And I think, keeping a bit of an open mind, you know. I can tell you, my wife will tell you, I was really a shy kid but when you get into sales, you learn, you know, you learn to be humble, because you’re waiting on clients a lot, and get a lot of confidence in yourself and you manage to make a sale. I think selling that turbine did a lot for me, you know. And I guess what I’ve tried to do over the years is try and teach my people to do that, you know. I guess I always tell this story. I got two daughters, you know, and the older one, she grew up in Burnaby, kind of a blue collar area, and she had a lot of friends that came from broken homes whatever, and she has a career in child care, worked with juvenile delinquents and whatever, so she’s kind of our social conscience. She was always raising money, and whenever she used to write letters, I used to give her a list of people to go after and she would say her name is Bess Wakabayashi. She never said she’s my daughter but these are all clients and people that I work with, and she used to do quite good, and she used to tell me that they would phone and say, “Oh Bess, I’m kind of interested in your program there, and I got a nephew I want to put in, and so I think I’ll donate some money, oh by the way are you related to . . .?” and so she did quite well. And one year she said, we need to get some money for this camp for the kids with learning disability that she used to volunteer at. So I said okay Bess, I’ll see if we can raise some money. In the first year, I said, we can maybe make a couple of thousand dollars or something. I think we did $7,000 that year, and we’ve had it for eleven years now and we give it to other charities as well. She was also at a special needs school, so we’d give them scholarships there, at UBC, and we’ve raised over $400,000 you know, so I always maintain that you learn from your kids. I still remember she said, dad, you know, we’re a pretty blessed family, and we really should share, you know, some of this with other people. So that’s her. Then the younger one, she’s a lawyer, and when she was going to law school, none of her friends went to university so it was kind of tough so I said okay, I’ll maybe study with you for the entrance exam, so she bought me a T shirt and the LSAT book at Christmas, and we used to run these things at home. She’d come over to supper and I’d get two out of five or three out of six, and she’s get five out of five or five out of six, and so I said to her, Wendy, you know, I think dad’s going to be pretty busy in February, so I can’t do it. But I did. So anyway, six weeks later, I got my results, and I got about 65, which I thought was pretty good among 5,000 people, right? And she got hers the next day and she phoned her mom and she was crying, and she got 90 something. People asked Wendy, “So how did you make out?” and she says, “Oh okay.” “So how did your dad make out?” and she says, “Well he won’t be going to law school.” So you know, in interacting with your kids, I think you learn a lot from them. We think we’re older and we know more. but man, I’ve learned a lot from my kids, for sure. So I guess you know it’s one thing to really do a lot of things in your work, but I think family is still important, and I think you know when I had my company I had about 40 odd people, and I’ll tell you, we treated it like a family, and a lot of the people have come on with us and I think they still feel like a family. One lady just retired the other day, and she was with us for about 22 years. Most of my people have been here that type of time frame. Any final words to share with our readers? I think it’s important to be Canadian, but you know, when I was working for Mitsubishi I didn’t feel ashamed of my Japanese heritage. As I told you, it really helped, but a lot of people at that time thought I should drift away and not be seen as a Japanese, but a Canadian. And I mean, I guess we should maybe capture or try to keep the good things about our Japanese background, whereas in Japan I think they picked up a lot of the bad things about the western way of life. There’s a lot of good things about it, but it doesn’t mean you have to go around pounding the table saying “I’m Japanese Canadian.” I mean, it speaks for itself. Also I think that over the years when we were working for the trading company, I noticed that the stature of the Japanese Canadians grew as Japan, the country did. And so I think we should all be very proud of our heritage, you know.